Anyone who has lived with chickens can attest to how fascinating they can be. Sit amongst them (check for a clean spot first!) for an hour and just watch their infinite little head movements, their funny style of running when excited (head down, stubby wings out, bums up), their variety of calls and chatter, and the way they interact. Yes, ‘pecking order’ comes from the hierarchy amongst chickens, which is sometimes quite complex. 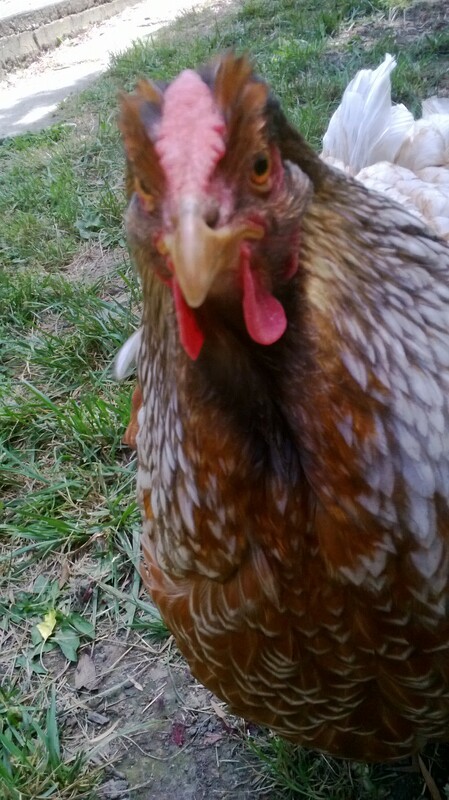 Our head chicken is Dame Edna, named for her purple-rinse neck feathers, her plus-size figure, and her, um, belligerence. She’s the failed result of my niece’s husband trying to breed a particular colour into his Wyandottes, a very fancy type of chicken. She is boss, but also protector of Paloma, our solitary black & white spotted Hamburg, who is much smaller than the others. Maude (the plain one, she didn’t receive the fancy feathers) and Lucinda (who did) sit somewhere under Edna and above Paloma, but they don’t dare attack Paloma if her big friend is nearby. Edna ALWAYS pecks Lucinda, and sometimes sits on her. 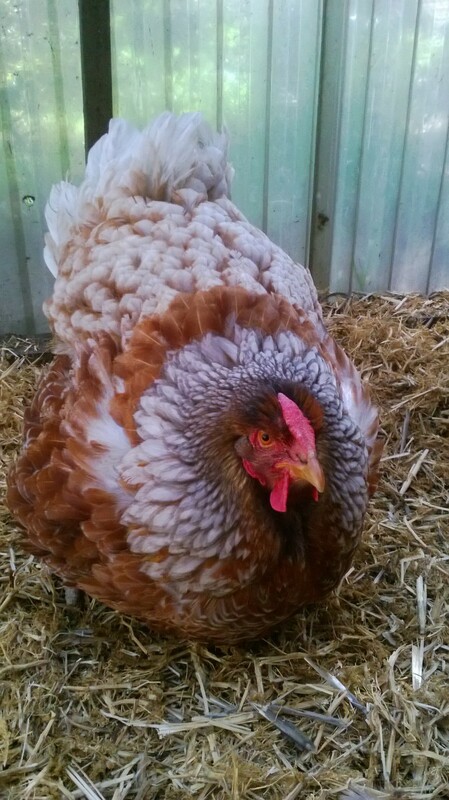 I think it’s jealousy of her pretty feathers, which have the proper Wyandotte ‘lace’ effect. It’s also noticeable in their scaly claws and spooky emu eyes, I think. But that aside, chickens are generally quite beautiful, the more you watch them. Certainly the cats think so – sometimes they lie and watch every little head movement, perhaps dreaming of a nice roast. The chickens’ feathers are pretty in the sunlight, even on a plain Isa Brown, let alone a fancy chook like a Wyandotte or Hamburg. Particularly when they’re healthy, free-ranging birds enjoying their dust-baths, foraging for insects and greenery, or just standing together while having a quiet preen. After all, it’s how chickens should get to live. Edna pulled off the laying box while broody. Not happy. The Wyandottes don’t follow the rules of their breed description on the website link above – rather they look pretty and lay eggs when they feel like it. This means they lay for a few months or so, then stop once the weather gets too hot. They lay for a few weeks, then turn broody for a few weeks, which means no eggs are produced while they sit in the laying box in a hormonally-induced state of meditation, barely eating, drinking or moving far in this time. They’re also incredibly grumpy in this state. When I forcibly remove them to make sure they get sustenance and exercise, it gets nasty, and I have the peck-marks on my wrists to prove it. Even the dogs stay out of their way. Then there’s the annual moult when they shed old feathers and produce new ones. That can take up to a month, during which of course, no eggs are laid. I’d show you a photo of one without most of her feathers, but she might sue me. So yes, basically our chickens are free-loading, grumpy, sometimes very noisy companions which only occasionally contribute to the household with their eggs. Oh, except their old straw and poo is useful for mulching & fertilising the vegie patch. Come to think of it, they may be more of an asset than the dogs and cats! I had to say that. Edna was listening. 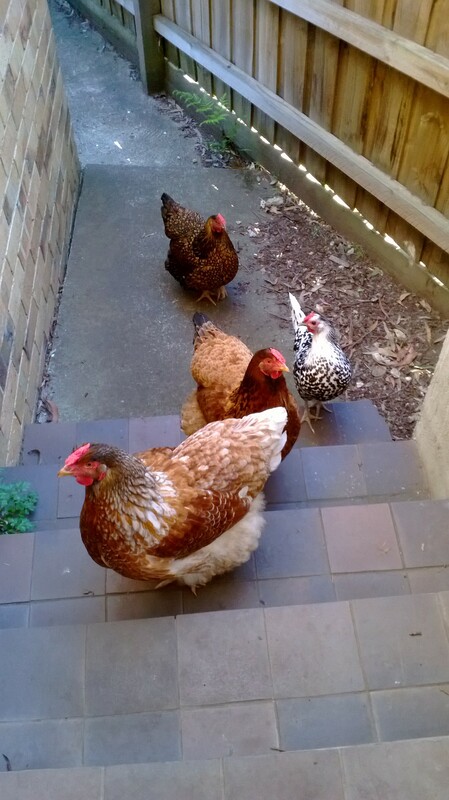 This entry was posted in Animals and tagged backyard chickens, chicken behaviour, chickens, chickens related to dinosaurs, Hamburg, Wyandottes. Bookmark the permalink. I got to that last paragraph thinking that the chickens sound a lot like the dog – except they provide something useful to the house (of course, Choppy would probably suggest that she provides love and the presence of a creature who is proven to decrease stress. Neither of these either reduces or pays the bills).